Exit I-8 at the Gray's Well exit to see a surviving portion of the old plank road. The sand dunes have become a center of dune buggy activity and the dunes are infested by swarms of these vehicles on the weekends. 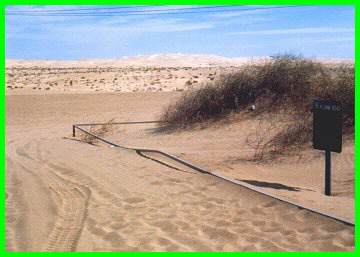 This area is also the site where the desert scenes from "Return of the Jedi" were filmed. In fact, the mountains to the east are recognizable in the film. After the freeway over crossing, Gray's Well Rd. turns sharply to the right and follows the old alignment of US 80 briefly. It is still plainly visible where the old alignment veers to the right and goes under the freeway. The road backtracks next to I-8 and after about two miles, turns sharply to the left and rejoins the old alignment. After about another mile, the road goes down a hill and a surviving portion of the old plank road is visible to the left. 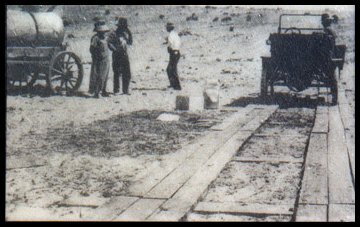 The Sand Hills with remnants of the Plank Road. First incarnation of the Plank Road, 1915 This portion of plank road is the last one surviving. In the past, people have taken the road and used it for firewood, not seeing the value in preserving it. General Patton's troops did much to destroy it during their training in the area during World War II. It is fortunate that the BLM fenced off this last section and made it an historic landmark. There are signs telling of the history of this road as well as two replicas of the two track and later versions of the road. This trip is well worth the time.